The Jokhang, also called the Jokhang Temple or the Jokhang Monastery, is a famous Buddhist temple in Lhasa, Tibet. It is probably the most popular tourist attraction in Lhasa. It is part of the UNESCO World Heritage Site «Historic Ensemble of the Potala Palace» and a spiritual centre of Lhasa. 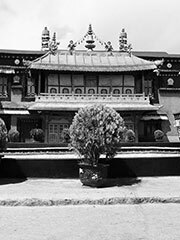 Jokhang temple was constructed by King Songtsen Gampo starting in the year 639. This temple has remained a centre of Buddhist pilgrimage for centuries, and over a period of last several centuries, the temple complex continue to be expanded and now covers an area of around 25,000 sq. meters. Jokhang temple is a four-storey construction, with roofs covered with gilded bronze tiles. The architectural style is based on the Indian vihara design, and was later extended resulting in a blend of Indian, Nepalese, and Tang dynasty styles. The rooftop statues of two golden deer flanking a Dharma wheel is iconic. Jokhang temple complex has several decorated shrines and rooms. The main hall of the temple houses the Jowo Shakyamuni Buddha statue, perhaps the single most venerated object in Tibetan Buddhism. There are also statues of King Songtsan Gambo and his two famous foreign brides, Princess Wen Cheng (daughter of Emperor Taizong of Tang China) and Princess Bhrikuti of Nepal.